Brothers of the Society of Mary (Marianists) brought Catholic education to San Antonio when, in 1852, they opened St. Mary’s Institute. St. Mary’s University, an outgrowth of the brothers’ first educational undertaking, committed itself to the Marianist ideals of academic excellence, ethical commitment and service to the community. The Marianists who established St. Mary’s were members of a religious order known as the Society of Mary, founded in 1817 by Blessed William Joseph Chaminade, a French priest who nurtured an idea of forming lay and religious societies that would reenergize the Christian faith in the post-French Revolution era. Four French Marianist missionaries traveled to Texas to open a school at the behest of Galveston Bishop John Mary Odin. In May 1852, these brothers stepped off the Indianola stagecoach to get a glimpse of downtown San Antonio where they would establish their school. 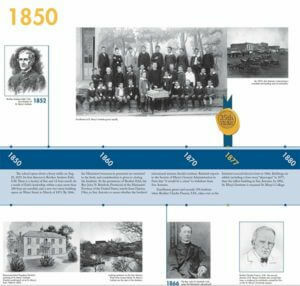 Click through these pages to read the highlights of St. Mary’s University’s rich and storied history, from our early days in the 1850s through today.